GreenWiseFlooring.com will install in places where most contractors dare to go...inside homes. We work directly with homeowners and small businesses one on one to insure a smooth installation. For this reason, our installation projects are limited to those less than 5,000SF. Solid surface natural stone flooring that can be customized to suite any decor. Extremely durable, outlasting all other flooring materials. Sustainable, environmentally friendly flooring that can qualify for LEED points. Greatly reduced maintenance costs, eliminates need for topical sealers and replacement of floor coverings. Lease expensive flooring option over life span of floor. The cost of terrazzo varies greatly, depending on what materials are used in the terrazzo matrix, as well as installation details. 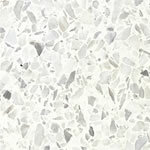 Since the prices vary so greatly with terrazzo, we can only provide basic pricing online, so please Contact Us for pricing information specific to your requirements. If you already have terrazzo and interested in restoring it, please refer to our Terrazzo Restoration page for further information. Table tops boasting team logos, corporate branding or other custom artwork. Planter boxes and outdoor benches. Municipal and public art projects depicting Florida's rich history with terrazzo.